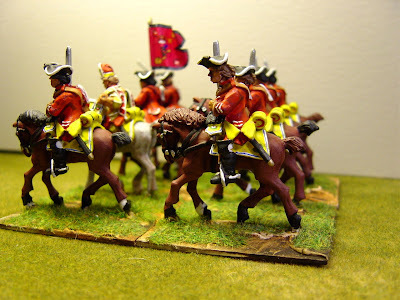 At last I have finished this British cavalry brigade for my "Pragmatic"/SYW army. It is under the command of Major-General Mostyn. 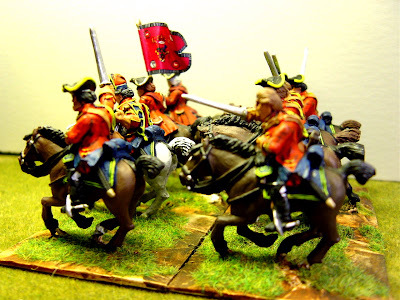 The top two pictures are of the 3rd Dragoon Guards, 3 squadrons totalling 12 figures. 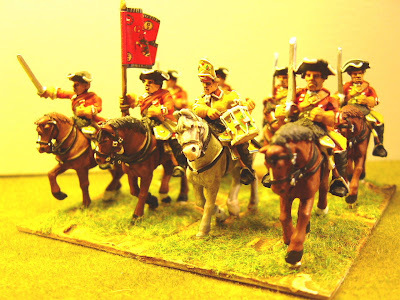 The next two pictures are of the 5th Dragoons (Royal Irish), 2 squadrons of 8 figures. 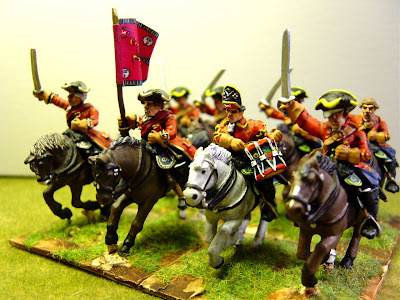 The next two pictures are of the 6th Dragoons (Inniskilling's), 2 squadrons again. The final picture shows the entire brigade. All figures are from the new Foundry range except for Mostyn himself, who is a Front Rank figure. 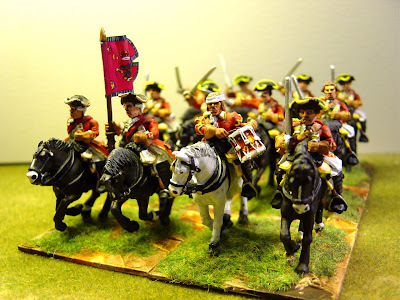 Painting cavalry is, for me, not as great a pleasure as painting infantry. I base my infantry in 2s or 3s for painting but base the cavalry individually. This involves a great deal of picking up (and putting down) and the whole process takes me about 3 times longer than painting infantry. 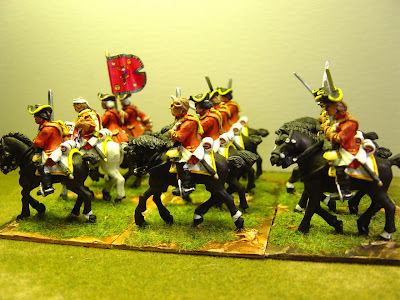 But I can't have an army without cavalry and during the 18th century cavalry proportions, as a percentage of the whole army, tended to be high - sometimes 35%.